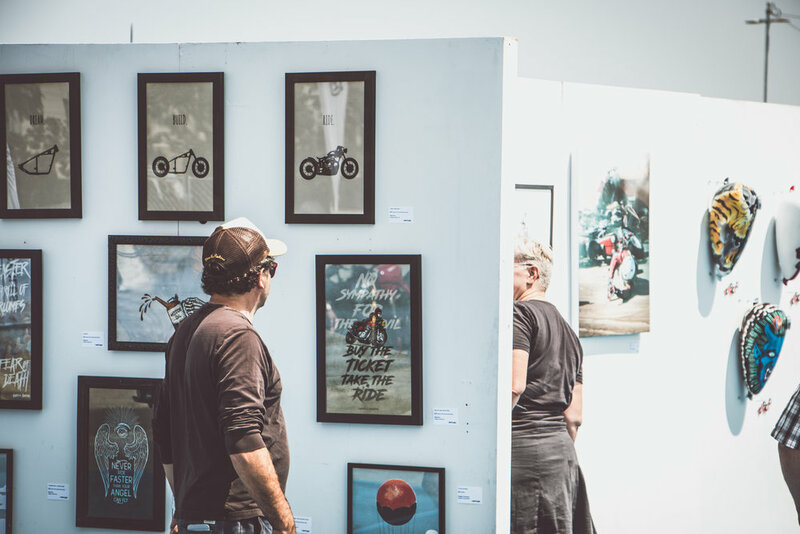 It’s no coincidence that motorcycles, music, and art give us a similar type of rush. All three help us to escape the routine of daily life, allow us to feel more alive—and free. 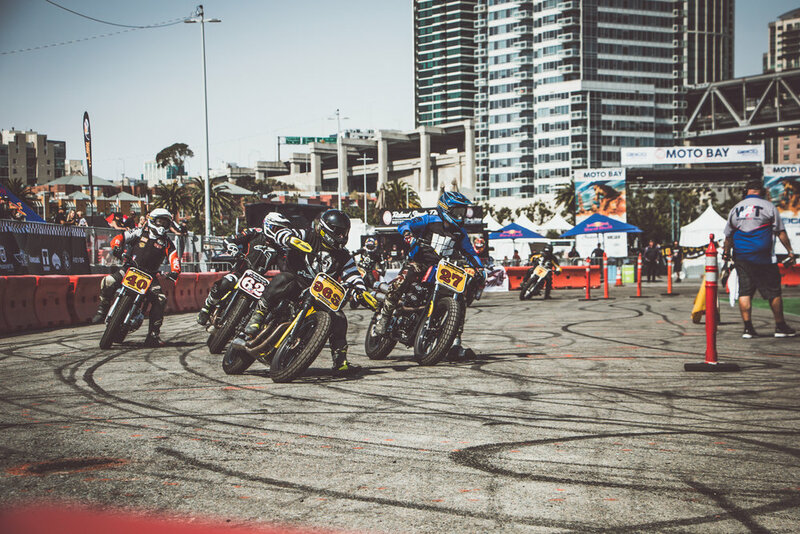 That’s why when we heard about the inaugural Roland Sands Moto Bay Classic in San Francisco, we knew we had to be involved. 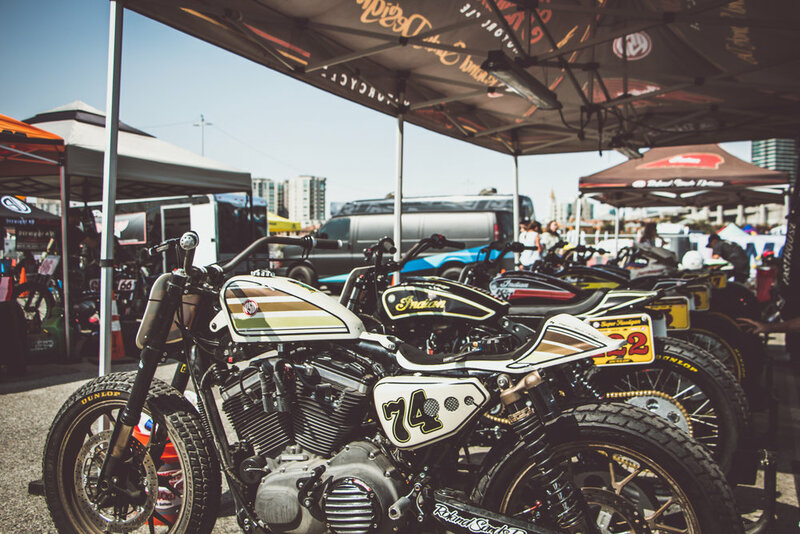 Moto Bay was inspired by the 2017 Moto Beach Classic held in Huntington Beach that combined motorcycle flat track and drag racing with a surf competition, art show, and music. 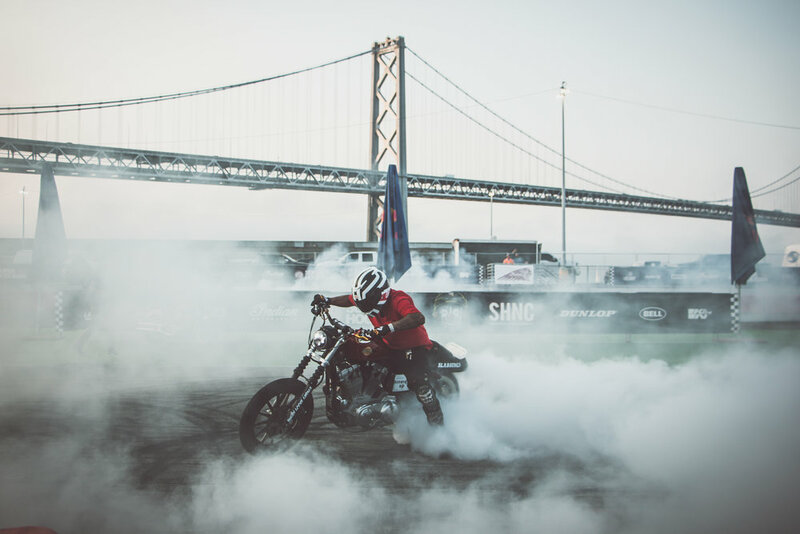 The event was an overwhelming success and for 2018 Sands decided to create a second Classic in the motorcycle-friendly city of San Francisco off the Embarcadero at Pier 32. 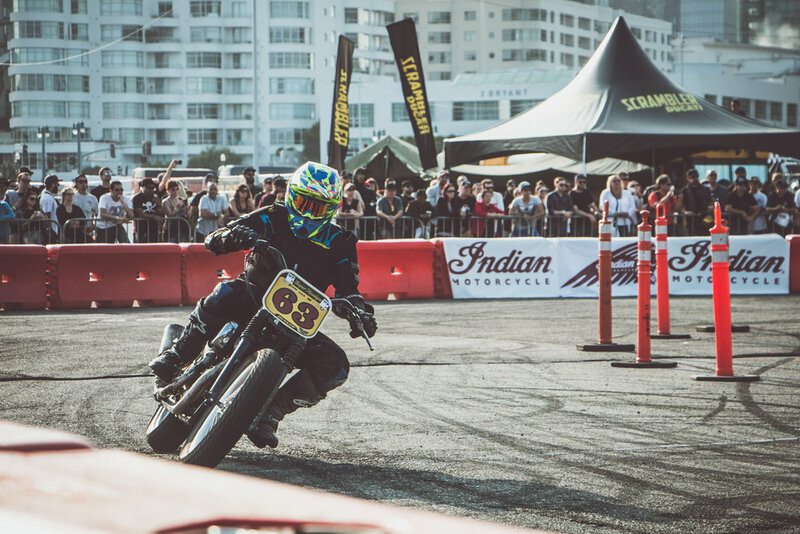 With its urban setting and spectacular views of the Oakland Bay Bridge, San Francisco Bay, and downtown skyline, Pier 32 is a picture-perfect place to hold a motorcycle event. 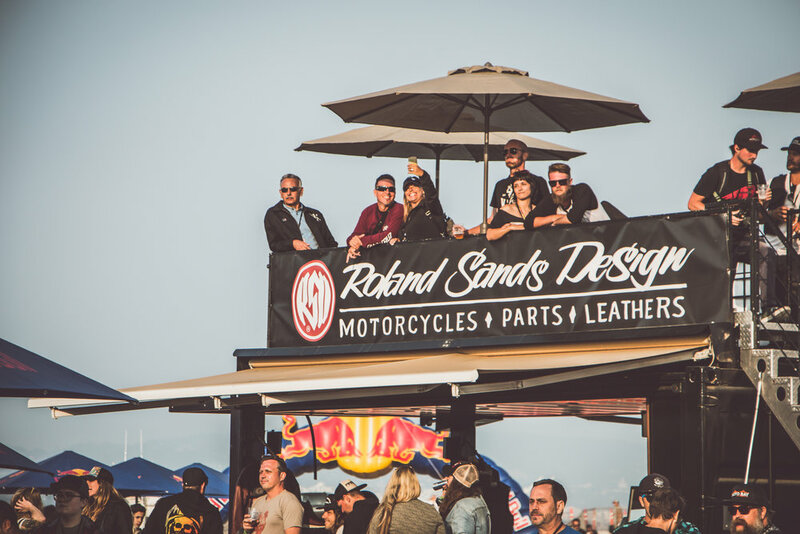 With racing, stunt riding, music, and art on the schedule, Sands created the Moto Bay Classic to have its own unique festival atmosphere with the same focus on fun as Moto Beach. 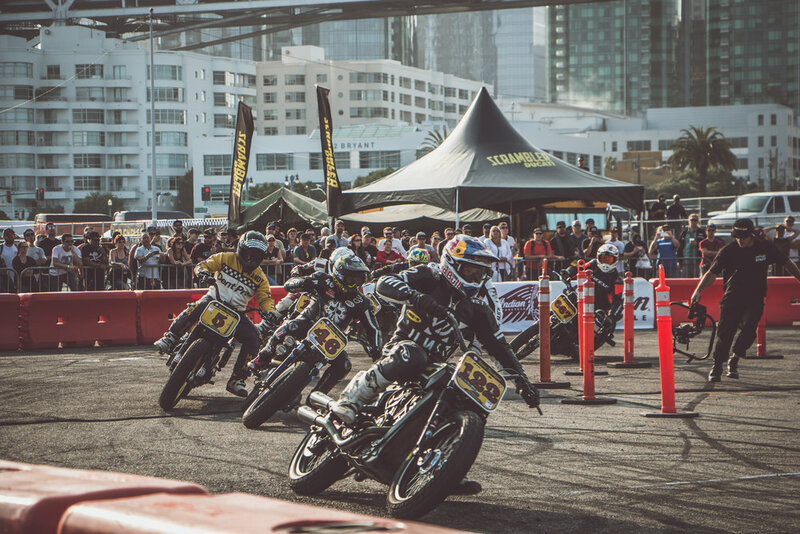 No stranger to motorcycle action, Pier 32 is the same location where the 2000 Summer X Games took place—the first to include Freestyle Moto-X. It was here that a then 15-year old Travis Pastrana recorded the highest score in X Games history with a 99.00 Gold Medal run. Less talked about, is that Pier 32 is also the location of Pastrana’s (in)famous jump into San Francisco Bay. 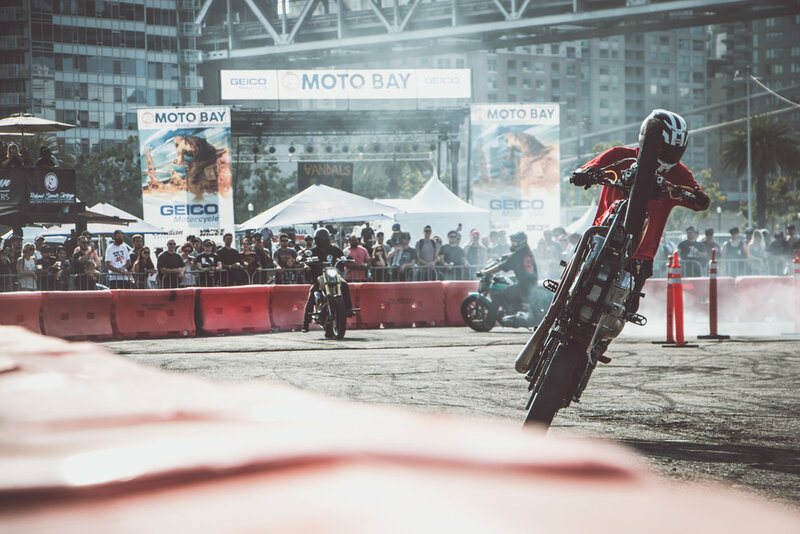 Having just won his first X Games Gold, Pastrana donned a life vest under his riding gear and proceeded to launch himself (and his Suzuki RM125 motorcycle) off a four-foot high berm into San Francisco Bay much to the delight of the fans in attendance. Needless to say, the city of San Francisco (and EPA) were not as impressed, and Pastrana’s leap into the bay is something that’s not talked about much to this day. 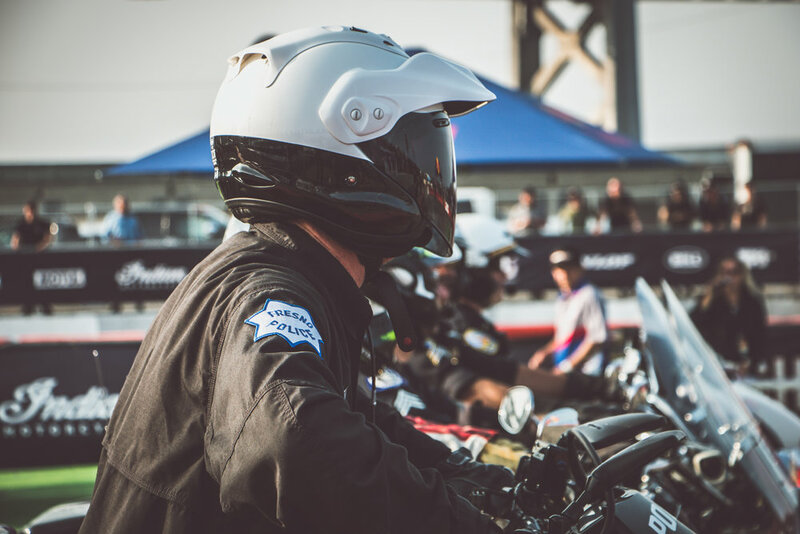 As the Tucker crew arrived at Pier 32 on Saturday morning, for final set-up, it was apparent from the laid-back vibe that we were in for an epic day. 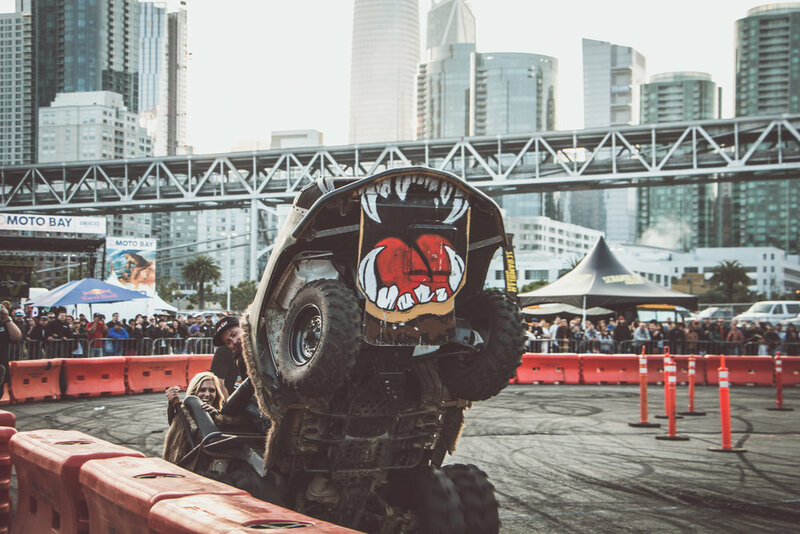 With our Tucker tents placed in ideal locations near the hooligan track, gymkhana course, concert stage, and art show areas, we were ready to entertain some of our bay area dealers and treat them to a VIP fun-filled Saturday afternoon in the city. Practice for the hooligan racers kicked off the program at 11:00am. If you’ve never been to one of these races we suggest you go if one comes to your area. The sound of these bikes alone is something else! Probably like the first time you hear a MotoGP bike or a Formula One car—startlingly impressive. The roar of the twin-cylinder engines combined with the smell of burnt rubber is infectious, and we laughed out loud like little kids as the raw, guttural sound reverberated through our chest like a bass drum. 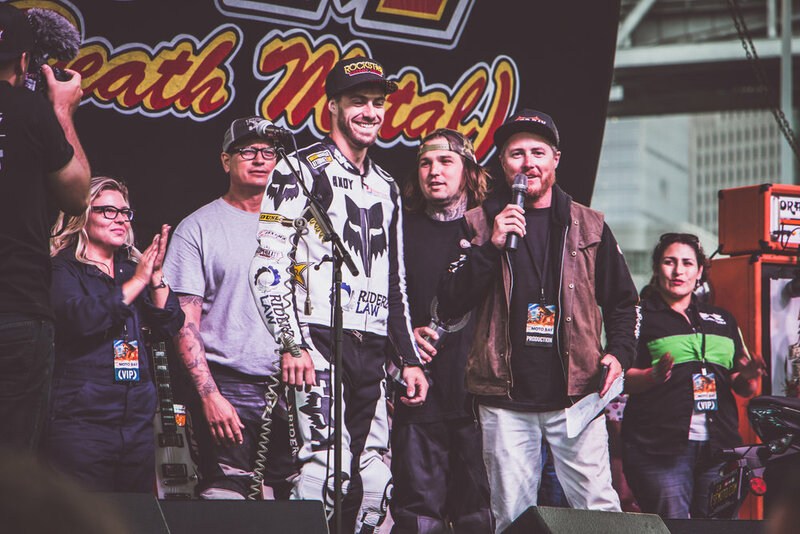 Although hooligan racing has been around since the 70s, “run what ya’ brung” racing has really taken off in the last few of years, and as a result, a national championship series was created. With events scattered throughout the western half of the country, the 2018 Super Hooligan National Championship Series (SHNC) is comprised of nine races. With a limited set of rules, racers must show up on a 750cc or larger street bike, from any manufacturer, and the rules focus on minimal fabrication to keep costs low. For example, a stock production frame must be used, and no geometry changes are allowed unless they are not bolt-on. The result is an accessible form of racing with a more level playing field and closer racing. 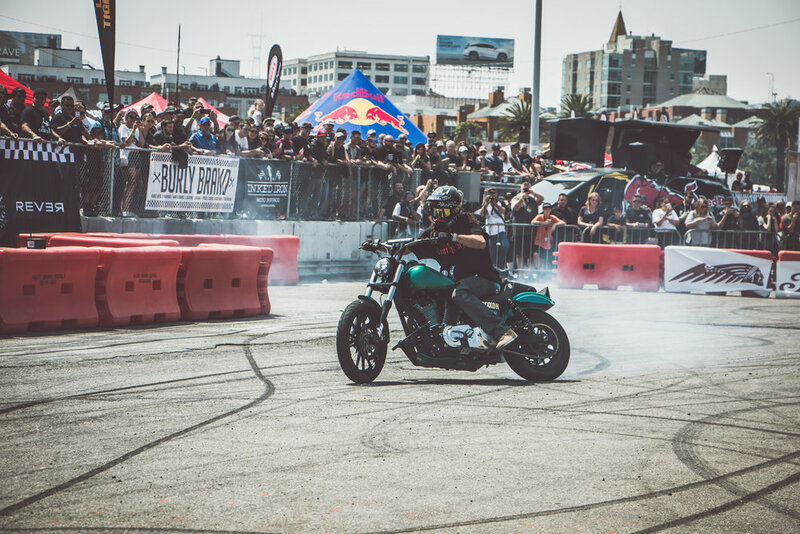 In addition to the premiere Super Hooligan, other less-serious classes include Run What Ya’ Brung, Air-cooled 2-Stroke, Mad Monkey Mini (150cc or under), SuperMoto, and even a small-bore XR class. 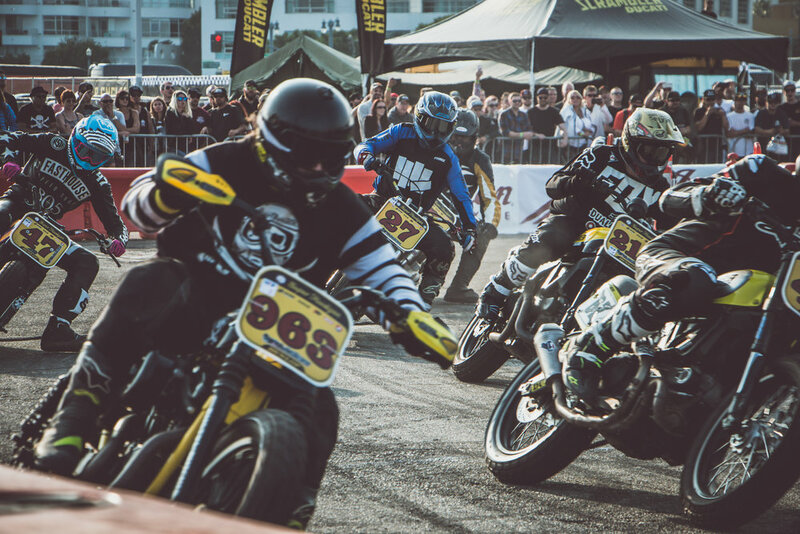 Part of the allure of hooligan racing is that the bikes the riders race are typically not meant for the racetrack. 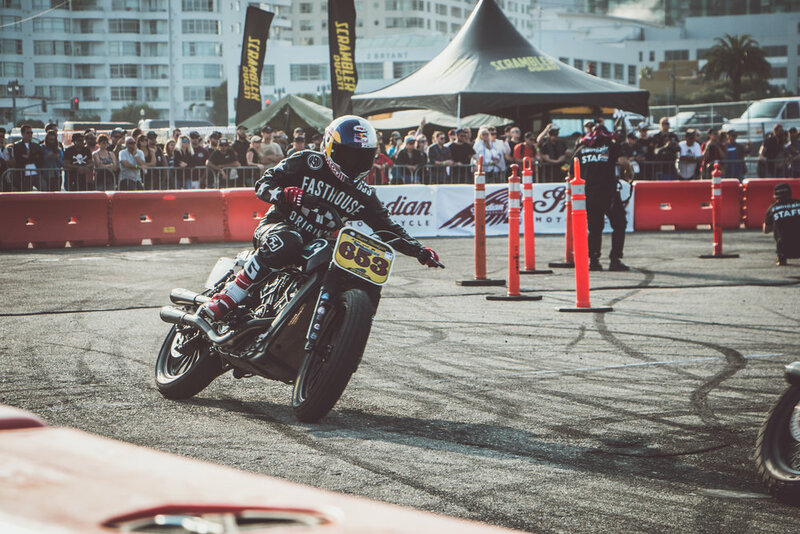 Instead of exotic and expensive factory race bikes, these are everyday motorcycles—which only adds to the grassroots street-cred appeal of hooligan racing. 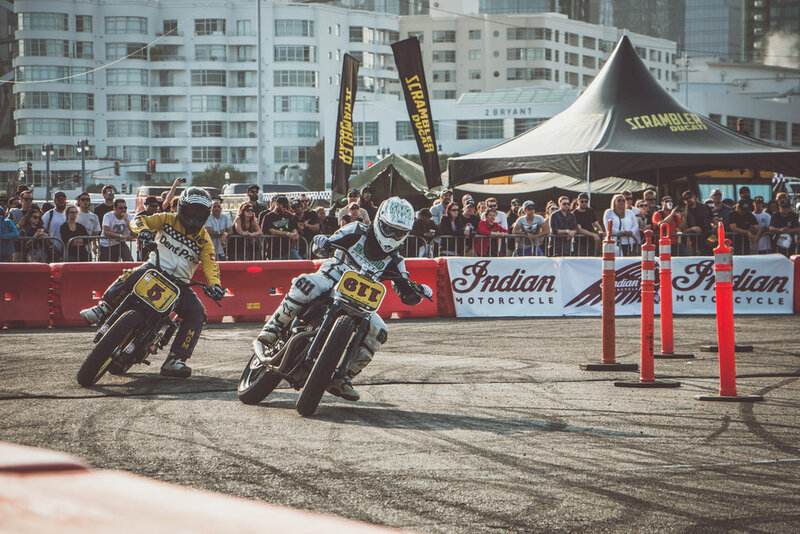 As the racers burned in the hooligan track, at the same time over on the gymkhana course, the finals of the fifth annual San Francisco International Police Motor Skills competition were going on. The competition started on Thursday with Semi-finals on Friday and the finals Saturday. Think these policemen just sip coffee and eat donuts all day? Think again! These guys can ride! Seeing the bike handling skills of these policemen possess was impressive—especially the ones riding police-issue baggers. A stroll around the venue around noon revealed the other Moto bay activities going on such as the “Kidkhana” electric strider bike demos for kids, the “Architects of Inspiration” art and bike show sponsored by Husqvarna (with content provided by META), and bike demos by several of the OEMs. 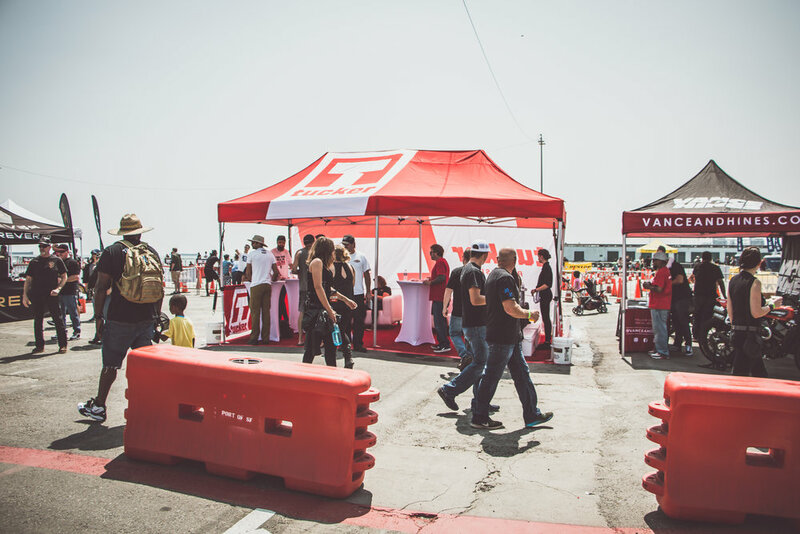 Vendors were scattered about selling their wares, and Tucker distributed brands Roland Sands, Arlen Ness, Vance and Hines, Performance Machine, Burly Brand, Progressive, and Dunlop were all in attendance to display product and interact with the fellow motorcyclists in attendance. Around this same time, the local punk band The Nerv kicked off the music line-up, followed by fellow bay area bands Lujuria and the Screaming Bloody Marys. One of our favorite events of the day took place around 2pm, the Cops vs. Hooligans Gymkana Showdown. The irony of these two groups coming together didn’t go unnoticed, and despite the requisite smack talk between the two groups, the competition was a show of mutual respect and camaraderie between brothers from the same motorcycle tribe. In true ‘run what ya’ brung’ fashion, riders from both teams took to the course on scooters, dual sport machines, Groms, hooligan bikes and police baggers in an all-out timed battle of bike handling skills. The cops held their own against the hooligans, fun was had by all, and Tyler O’Hara recorded the fastest time by 0.08 seconds to give the win to the Hooligans. Look for the cops to return next year with a vengeance (and for redemption) at the second annual Cops vs. Hooligans Gymkana Showdown. The main show kicked off at 3pm with the national anthem followed by a fireboat water cannon display put on by the San Francisco Fire Department. 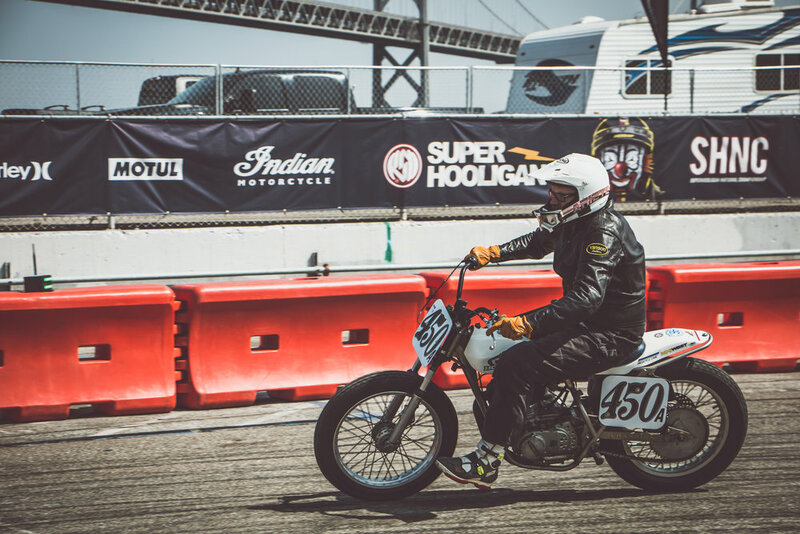 Hooligan racing commenced and Long Beach punk rockers T.S.O.L. hit the main stage for their set between the heat races and finals. Andy DiBrino took a close-fought win in the Super Hooligan final with Robert Bush and Mikey Hill rounding out the podium. 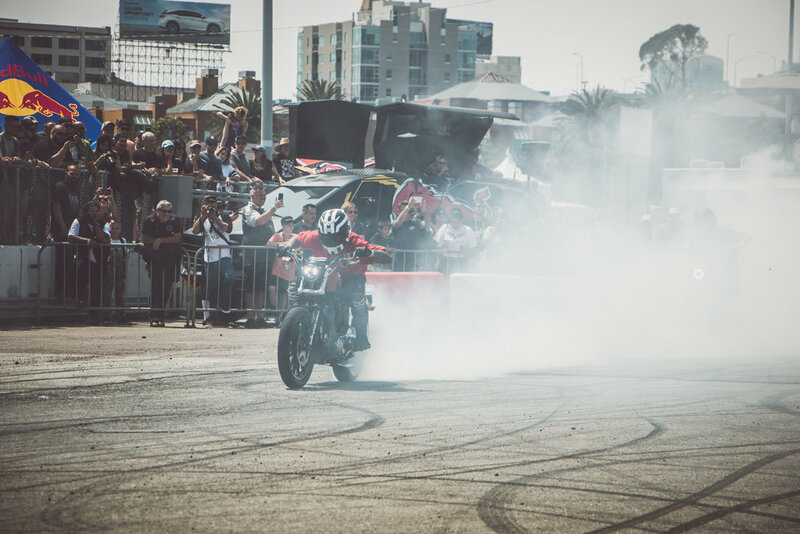 A crowd-pleasing display of tire-shredding burnouts followed the finish and the air filled with smoke while shards of flying rubber peppered fans lining the race course. It was awesome! The show wasn't over yet, and with the crowd pumped up after the Super Hooligan main event, The Vandals hit the stage for some Orange County punk rock before the stunt riders took to the hooligan course for an entertaining display of wheelies, powerslides, burnouts, and impressive demonstration of bike handling skills. Sands joined in on the fun with his custom-built “Squatch” Polaris Sportsman ATV retrofitted with a Toyota Tacoma front end and old couch welded to the back. Sands cranked off wheelie after wheelie around the hooligan course with two passengers onboard surrounded by the stunt riders. The Sands wheelie show shenanigans ended with an unsuccessful attempt to smoke the tires off The Squatch. But wait, there’s more! The remaining crowd headed to the main stage for a brief awards ceremony before the Eagles of Death Metal brought down the house with an energetic and engaging set. Lead singer Jesse Hughes is a character on stage and the epitome of a rock-and-roll entertainer. He’s also a fellow motorcyclist and a friend of Roland Sands. To see Hughes and his EODM bandmates enjoy the company of fellow motorcyclists, in such an intimate setting, was a rare treat. As they tore through their set and closed out the day’s show, it seemed like the fitting end to a unique event. 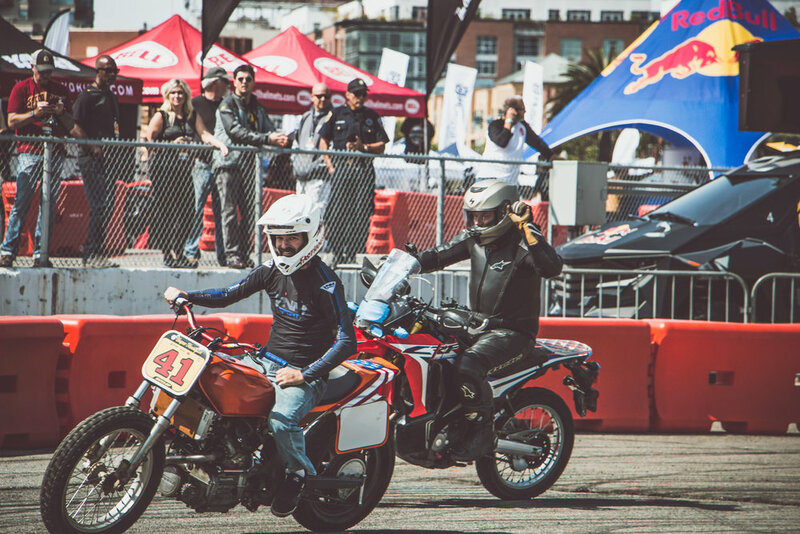 With its mix of motorcycles, music, and art in a laid-back festival setting, the Moto Bay Classic had all the right ingredients for a perfect day of fun. 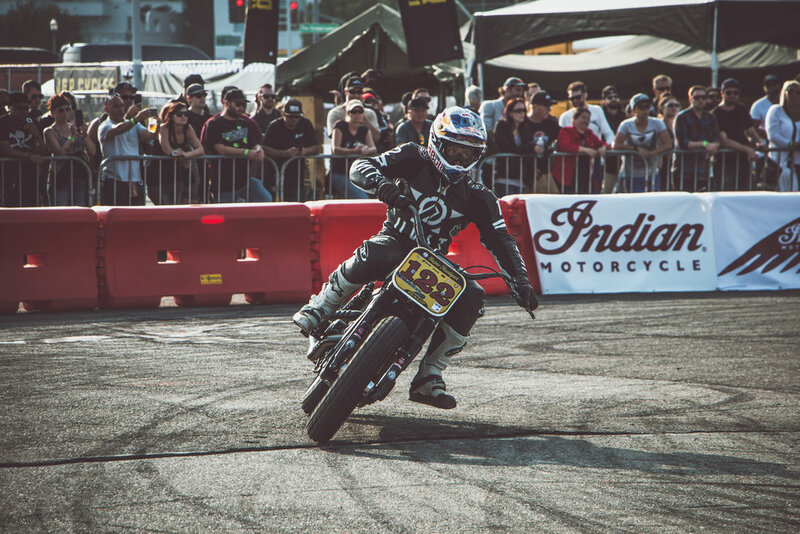 As the event’s description states, “the RSD Moto Bay Classic promises something for everyone. With a constant flow of activities and participation from attendees, you’re not just watching the show, you’re a part of it.” Based upon our personal experience, and the fun we observed, we’d say the RSD crew hit the mark.